Not all jazz happens in public settings. Informal sessions in living rooms, basements and garages are part of a time-honored tradition. For example, Joe Dorris' basement. 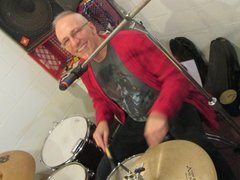 Drummer , singer, harmonica-playing Dorris has accomodated fellow musicians in a basement remodeled for this purpose. (Joe'd day job is as a construction contractor, so he did it himself.) In addition to regular rehearsals for the band "Cats A Bear," the basement music room became the site of weekly jam sessions. The genesis of the sessions arose from a conversation Joe had with pianist Dave Calabrese at the papermoon restaurant, where Joe had a regular gig with Basil Ronzitti and Dave was an avid listener. Dave was looking for a chance to try out his growing skills, and Joe offered to gather some other musicians, both established and budding, for a trial run. That was 11 years ago, and the sessions are still a regular event. Usually attended by six to a dozen musicians, some of the regulars, in addition to Joe and Dave, are guitarists Frank Singer, Vinny Stgefanelli, and Joe's nest door neighbor and former music store owner Jim Lynch, singer Juliia Hamilton, bassist Tony Stefanelli, pianist Paul Olson. Frequent visitors, past and present include saxophonists Phil Popotnik, Sam Seghi, percussionist and drummer Nick "Tito Ronzitti, Jim Madden (on electric bass), and many, many others. Of course it's partly "the hang," a chance to get together with friends, catch up on what's going on, exchange stories, and all that. But its core is always the music. Making music together in small groups is one of the more intimate ways in which humans interact, And every once in awhile things really work out. That's what one lives for. And you can learn new stuff, and try out some ideas. And work on keeping one's skills intact and growing. 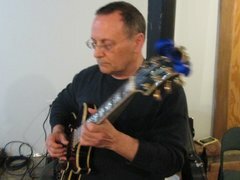 I have participated in at least four other home-based sessions, each with a different groups of musicians, over the last few years, And that's just a small sample in the universe of regional musicians. And of course none of this counts the gigs where players may not know each other well (or at all) but are drawing from the same knowledge base of standards and jazz tunes, and working things out as they go. Not a session as such, but not so different either. Among home-based jam sessions, few are as long-lived and frequent as Joe's. But they're out there, and always have been. It's how jazz stays alive.